School counselors often feel under-prepared for the career, but relevant field experience with a trained site supervisor can help. Create a positive experience for you and your interns that improves their learning experience and benefits your school's comprehensive school counseling program. Download accompanying handouts. 1. Discuss ethical guidelines related to site supervision. 3. 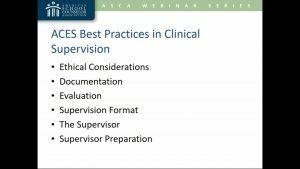 Apply strategies to your current practice to improve the supervision experience for your interns. 4. Create an experience for interns that further develops their knowledge, attitudes and skills in implementing a comprehensive school counseling program.